Martinique is a popular destination for many sailing trips – very many yachts are stationed in Fort-de-France and in the South in the huge Port de Plaisance in Le Marin. 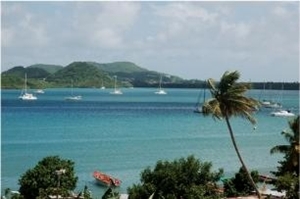 From here most Yacht Charter crews head to St. Lucia and the Grenadines. But Martinique in itself is worth the journey. The most northern island of the Windward Islands is part of the French Département d’outre-mer with all its civil rights. Mont Pelée, a not entirely extinct volcano, characterizes the North and is the highest elevation with roughly 4.600 feet. The vegetation on the whole of the island is lush and tropical with lots of flowers (the Caribs named the island Madinia – flower island), giant ferns, bamboo, banana groves and pineapple fields and until today also sugar cane for the production of rum. The inhabitants of the island, communicating among themselves in Creole language, tend to live more and more off the tourism. Especially during the last years, the infrastructure for sailors has been extended with new marinas like Trois-Îlets near Fort-de-France, Le Robert and Le Francois on the Atlantic side plus Sainte-Anne in the South not far from Le Marin. Even big sailing events and races are staged here more often than before. The Mouillage de Flamands is a popular anchorage for yachts from all over the world. The Cohé du Lementin in the Northeast of the Baie de Fort-de-France but also the roadstead off Trois Îlets in the South of the bay with a lovely village ashore or else Trois Etienne offer good protection for anchoring. At the back of Pointe du Bout with its marina lies Anse Mitan, a popular anchorage for day trips, since the sea here is more inviting for swimming than directly in the Baie de Fort-de-France. Beware of the so-called “idiot’s reef” Caye des Couillons off the island of Anse Mitan. On the way south towards Cape Salomon, the island of Anse Noire awaits with a black beach and restaurants for midday luncheons. Weekend destination of the locals are the Grande Anse d’Arlet and the Petite Anse d’Arlet rearward of the Cape – with a sandy beach, pretty holiday homes, lots of greenery and several Creole restaurants with big traditional fishing boats on the shore of the little bay. The vast bay Cul-de-Sac Marin with Yacht Charter bases in Le Marin stretches along side of the Southern coast and reaches two miles into the land. In the East of Martinique, on the Atlantic coast, marinas have been built in the fishing villages of Le Robert and Le François. The east coast itself is, like on so many Caribbean islands, rather rough. In the Northwest of the island at the foot of Mont Pelée lies the little town of St. Pierre. It has been destroyed during the last big eruption of the volcano; today wrecks of the boats that sunk at the time are the target of scuba divers. St. Pierre has been re-erected on the ruins and the bay makes for a good stopover on the way from or to Dominica. You can amble around in the picturesque little town or go for a scrumptious meal. There are important yacht charter fleets with sailboats and catamarans for bareboat charters in Martinique that are not listed in our Yachtfinder – please ask for offers. And of course we will be glad to send you offers for the most beautiful luxury charter yachts with crew in this area as well. Martinique is a very popular destination for charter holidays on board of luxury yachts, super yachts or crewed catamarans. Here you can find more information about luxury yacht charters. We would will be glad to organize your luxury yacht charter in Martinique – please ask for offers!